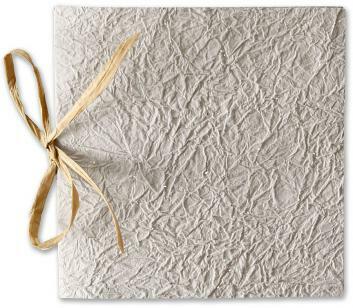 Eco rsvp set includes 100% recycled milkweed cardstock with 100% postconsumer recycled milkweed A2 envelope (heavy weight, 70 lb paper). You print 4 rsvp cards per supplied sheet, and cut. Or, we print and cut for you. Current crinkle paper is a natural soft white - a bit darker than photo. An eco wedding invitation that suggests sparkling sands and dune grass. Booklet style invitation with crinkle soft white handmade paper and mica bits throughout. Print on cotton and silk paper, bind with natural paper raffia. Mails in 100% postconsumer recycled paper envelope. Diecut and scored booklet (slightly rounded edges, scored for fold, and diecut holes for binding). !00% cotton rag. Invite sheet is natural handmade lokta paper from the mountains of Nepal. This paper prints beautifully. Square mailing envelope. (requires extra postage) PAPER FACTS: Invitation is made from all handmade paper. Cover paper is made from recycled cotton rag in India - with bits of real mica through out. Invitation sheet is 100% handmade lokta paper. Made from a sustainable and renewable bush. Envelope is 100% post consumer recycled paper. Invite Sheet:Lokta natural handmade paper: measures 5.5x11 inches. Folds 5.5 sq.